Sam's Tasty Art: Creativity, Expression, Education, and "The Dip"
Creativity, Expression, Education, and "The Dip"
Based on things I've read and seen (ie. 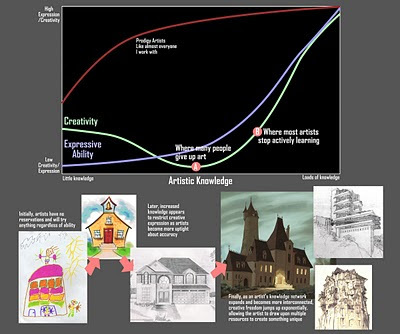 just a hyphothesis), I believe there's a big dip in creativity as artists increase in learning. I think this is one source of the common (but mistaken) idea that education inhibits creativity---because most people and artists stop actively learning about their craft before they reach their creative and expressive potential. This graph illustrates my hypothesis that after the big dip, if an artist continues learning, comes a leap in creativity and expressive ability. The key to reaching that point is pressing through the dip and not assuming that you already know enough. I separated expression and creativity because I think expressive ability never takes a dip, but it is accelerated as creative ability is unlocked. Also keep in mind that this is all learning, not just learning construction---although construction is still the foundation for expressive learning. This graph doesn't represent any particular period of time, and can actually happen multiple times over an artist's development (ever experience art depression? You're probably at the bottom of the curve and just need to press forward and try to learn more.) An artist can also simultaneously be in different stages of the graph for different abilities---e.g. very creative architecturally but not as creative in designing creatures. Also, I put in the red graph for anyone who happens to be amazing and never experienced a dip. You are awesome, and you really shouldn't waste time reading my blog. Unless you are part of that elite group of people who are still in the dip but don't realize it (we all know one or two). I think you hit on more than you realized when you said "Also keep in mind that this is all learning..." I think many disciplines have similar curves we gain a certain amount of knowledge and might hit a "wall" which should be considered more like a dip. If we can keep pushing forward then possibilities are opened for us. I am in one of these dips I think, but this different perspective might be just what I needed. This makes me scared that im in the dip, does that make me not in the dip ? Dip=bad. If there ever was a way to combine art and math, i think you just did it...nice graph. Sam, your blog is like heroin! I could spend an hour looking at all your different posts. And then shamefully I have to come back for more the next hour. This is why I’m not surprised your blog hits. Your artistic knowledge graph is pretty good. I would say I haven’t given up art, and I’m still learning. But I think I’ll continue pressing forward until I reach LOADS OF KNOWLEDGE. Also, I like your digital life drawings. I would think that it must be difficult to do. It’s interesting to think about how your set up would be, replacing an easel with a tablet\laptop? I’ll have to try that some time. And yet, I think you have to factor in the introduction and discipline of construction into the dip - because while you are blissfully ignorant of the existence and significance of technique, you can fly - then you introduce the realization that you have been doing it "wrong," and the self-consciousness that results from that shock, and the subsequent work of acquiring the technical skills that start out as absolutely deliberate, but will - in some universe, far, far away - become motor memory - these things suddenly make the creative process slog. Discouraging. I remember having one of our educated musical friends finally telling me how you are "supposed" to lead music - because there is a codified technique. For the next many months, I couldn't lead anything anymore. I kept worrying about going left or right or whatever. Then I dumped it all and went back to expression - so I'm never going to be hired as a professional. But I do better now than just getting the job done. I can make them fly. superguy: Yep, I think it applies in other areas also. Robert McKee talks about "hitting a wall," and says it's due to a lack of information about the world you're writing about and suggests that you do research and work out some of the underpinnings of your creation. So if that's true, "the wall" is basically "the dip." Isaac: You can be aware of the dip or not, it's sometimes what K's comment refers to with self-consciousness, but I know there are areas where I'm in a dip but haven't recognized it yet because I'm not focusing on that area, or I think I'm okay in that area. Realistically, my entire life as an artist has been happily ascending small hills in the trough of a giant dip. K: I think you're absolutely right and that's one of the main reasons for the dip's existence---whereas extremely talented people (like my brother when he was learning the piano) tend to ignore their ignorance and find ways to be expressive no matter how little their knowledge is. I'm unfortunately not one of those people and that's why I gave up the piano at 14 (coincidentally, right when my brother's talent took off). I think it would stand to reason that creativity dips b/c your investing yourself in the techniques and tools of your craft, hence we'd all have less space for creativity. That's been my experience. I struggle when learning something new until I don't. Though, mostly, I struggle. Great blog. I really like your perspective and willingness to share. That's not a universal quality. Something that kept me wondering about the knowledge of the areas i'm supposed to cover and the order of things generally. i keep assuming that the best condition during early development is to ignore those statistics from being a kind of factor to my practise progression just because i'm sure that i'm still learning and basicly don't know what i supposed to feel or know about this part of my artistic life. Furthermore i've always wasn't quite sure of what i need to focus on, what areas needs to be explored and when, from these ill get the "big picture" (i think) and understand or see if im in a dip, how do i cover all the areas? is it ever important to be "introduced" to the position that im in trough time? I'm in the meliorating part of the dip, however still a bottom feeder. I've also noticed that self-doubt and confidence are outmost important factors in recovering from the dip. To me 'the dip' is treaturous because if I accomplish something it feels like I'm at the top of the curve.. Anyway, interesting take on the problem of learning. I am in my second dip. Explain that! Ovad: I think those are good principles to live by, and if I'd add one I'd say, "-Have fun with the learning process"
Cyree: Happens all the time, in fact you're lucky you've only run into the dip twice. Thank you everyone for the thoughtful posts and responses! whenever i get in a rut, what works best for me is literally trying to draw like a little kid. I never knew why it worked, but now i do! As an art student who feels that his skills are sistematically below what's in his head, this has been a lot of help. At the very least, to know that most people go through that frustration (and overcome it). I think it's just a left brain vs right brain issue. When we are "ignorant" we tend to let the right brain act. When we are learning, the left brain takes its place, and only when our skill is at creativity's service (at the "end" of the path), the left brain coexists subordinated to the right brain. Kinda. An interesting thought on the subject of creativity. On second thought, Sam. What do you do if you actually ARE a dip? I suspect that's my problem. I'm a fan of this comment you made: "Realistically, my entire life as an artist has been happily ascending small hills in the trough of a giant dip." I feel like I can relate to that, especially! Thanks for the post great insight. Life as an artist is not as easy as one may assume, the comments here have been little away from the reality though. being involved in art education schools in the US, I know what it takes to be creative and the dip that the author is talking about. Oh I believe in the dip . . . was actually looking for a similar graph to yours, only it is a series of dips and highs - which is possibly closer to what I experience. Sadly it means you are only really happy with what you do for a short period of time . . .
Jane: It's true that the dip is usually a recurring thing. The point of this post was how to muscle your way through a dip, but more importantly, to avoid becoming complacent just because you ascend out of a dip. oh, any complacency I've had lasts nanoseconds - if that! always asking "whats wrong with this painting?" - which I find is the commonest experience for painters - maybe it is what keeps us going. Very insightful little graph lots of dips within those curves, of course, but I sure agree with the overall assessment!